This is part grabbing historical Thermal Store notes to one page, and part adding new notes. 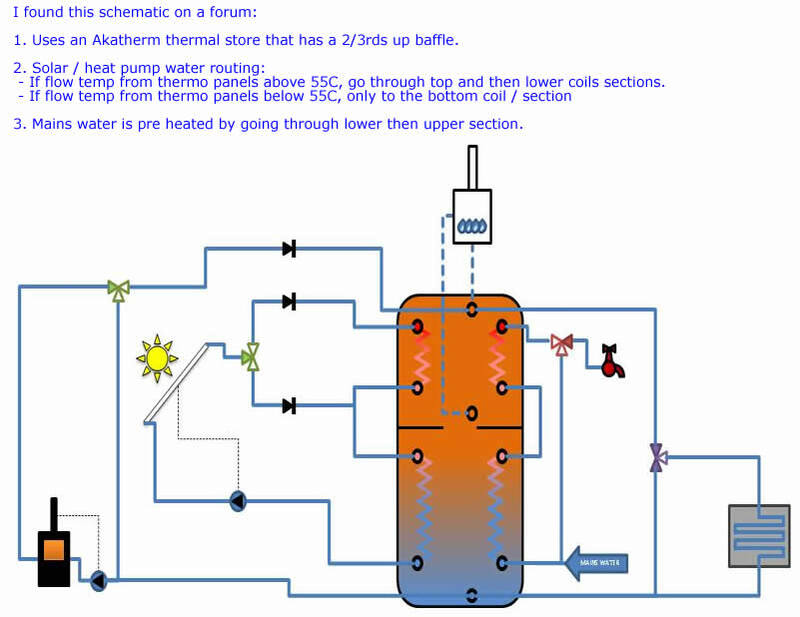 Click here for notes on Thermal storage – pros & cons. have a stratification baffle plate about a third of the way down the tank. (see photo below). This can be optionally upgraded to an insulated baffle to further improve performance but the added benefit is not huge as it is very good already. Once the water above the baffle has been heated to a high temperature by the heat pump (50ºC-60ºC) it then shifts to heating the bottom two thirds of the tank to a much lower temperature suitable for underfloor heating (around 40ºC). 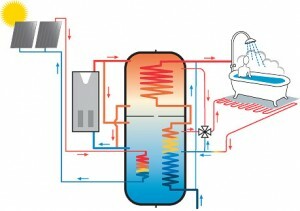 OR if / when the heat pump is generating lower temp water (often more efficient COP) it only targets the bottom section. 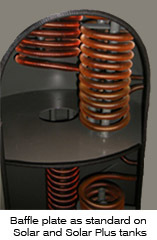 larger than normal lower domestic hot water coil. This is to ensure that the incoming mains water picks up as much heat from the bottom of the tank which holds the ‘cheaper’ heat produced at a high C.O.P. The AKVAir Solar Plus is available from 300-2000 litres and is 3 bar pressure rated. The tank has 4 coils, two for solar input and two for domestic hot water (DHW) and is divided by a baffle plate, approximately 60% below and 40% above the baffle. Each section contains one solar and one DHW coil and all coils are positioned vertically. The AKVAir Solar is available from 300-2000 litres and is 3 bar pressure rated. 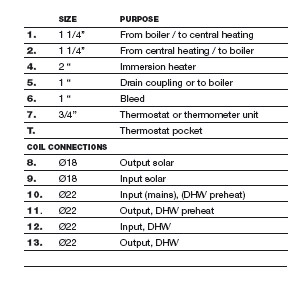 The tank has 3 coils, one for solar input and two for domestic hot water (DHW). AKVA GEO is suited to all heat sources (others seem to be solar or something specific). For larger domestic and commercial projects, our dedicated heating buffer cylinders are used in conjunction with our high-gain unvented cylinders to allow greater variation between heating and hot water demand. 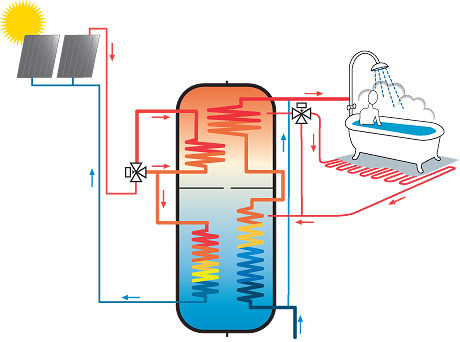 The separate low-temperature heating buffer allows the small, infrequent heating demands of a property that is “up to temperature” to be met by stored renewable energy before activating the heat pump/boiler to reduce wasteful on/off cycling. A great article on Energie Solar Thermodynamic Hot Water – Comparing Running Costs. Also look at this post about how they see the systems working, being installed etc. on a really good day (sunny and warm) it will supply at most 4.55 kW of energy and will consume 595W. On a bad day (cold night) it will supply 2.8 kW and consume 890 W – so the coefficient of performance would vary from 3.14 to 7.64 – so for every unit (kWh) of electricity you consume you would return between 3.14 and 7.64 kWh of heat for hot water. As of February 2012 average gas prices were 4.1p per kWh and electricity averaged 13.7p per kWh. Gas (and oil) boilers have a small level of inefficiency (at best they are 90% efficient over the year) and thus the cost per kWh of “heat to the water” would be 4.56p. With the Energie system the cost would average at 2.54p (13.7p divided by 5.39). Jewson is the only national builders’ merchant with exclusive rights to the new and innovative Thermodynamic Atmospheric Energy Panels, which can generate 100% of hot water and heating requirements all year round. Trade professionals should be aware that to be able to install the panels, they will need to be F-Gas registered and to have attended an official installation course. Both of these courses will shortly be offered at our Greenworks Training Academy. The Jewsons blog implies they will be eligible for the RHI (Renewable Heat Incentive). I called into my local Jewsons this morning to ask about the panels and what information they had.the guy on the front desk was a waste of time, did’nt know they did solar panels of any description, so I explained what it was I wanted and the guy in the office chipped to say they had been discontinued. Suggested they neededto update the web site and was told where to get off!!! Great customer service! I have had two quotes ranging from 6k-9k and I am not sure how much these are and how to compare the two? certainly don’t pay over £5k for a single panel and 250l tank fully installed. TBH I don’t really see why it should need to cost more than around £3.5-4k if you deal with an installation company instead of a sales company, …… with the commission structure. One thing though is I think there’s probably a temporary shortage of people with FGas certificates along with the other qualifications, for installing this in line with the regulations, which is probably keeping some competition out of the market. If you need a hot water solution now then fair enough, if not then it’s probably better to wait a few months for the dust to settle.